THE family-moon is over for Chris Hemsworth and Elsa Pataky. After ringing in the New Year on a skiing trip with newlyweds Liam Hemsworth and Miley Cyrus, the Byron Bay-based couple touched down in Brisbane this morning. 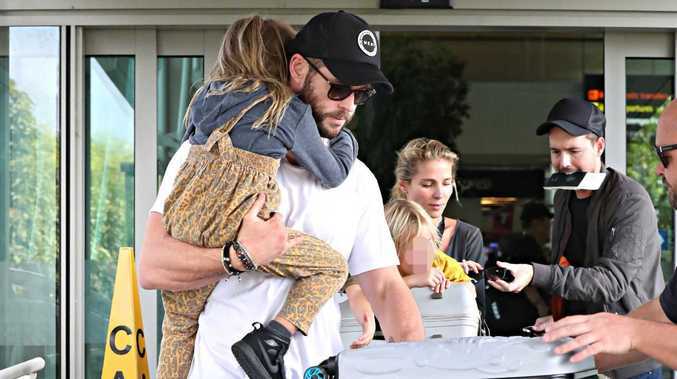 Hemsworth and Pataky carried their three children, India-Rose, Tristan and Sasha, as they left Brisbane airport with a large haul of luggage in tow. The Hemsworth clan with their large haul of luggage. The celebrity couple attended Chris' younger brother Liam's low-key nuptials with Cyrus in Nashville shortly before Christmas. They then joined the newlyweds, older brother Luke Hemsworth and Miley's mum Tish and sister Brandi at a ski resort in Montana, where they celebrated the New Year. Chris Hemsworth with two of his kids at Brisbane Airport. Pataky recently posted a video showing the family rugged up in their snowsuits building a snowman with the caption "Do you want to build a snowman?" She later posted a photo captioned "Happy 2019" with a photo of her and Chris sharing a kiss. After the low-key wedding of Liam and Miley, Miley shared several snippets of the day on her Instagram account, including one of her singing. 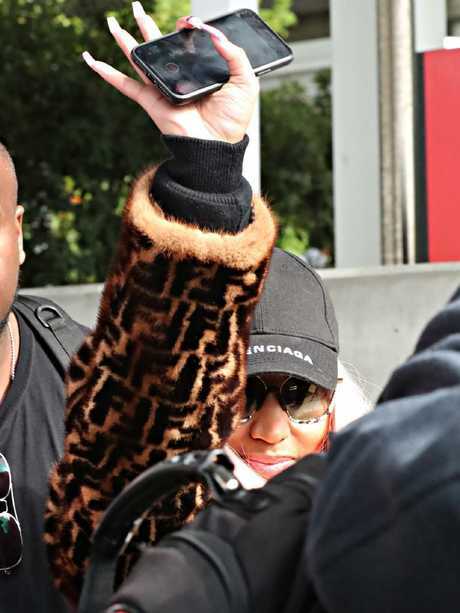 Meanwhile rapper Nicki Minaj also touched down in Brisbane this morning, flanked by a large security team, ahead of her appearance at FOMO festival this weekend. Nicki Minaj arrives at Brisbane Airport.